“Ag is Cool” at the Ohio State Fair! The 2013 Ohio State Fair took place over a beautiful 12 days from July 24th to August 4th! History was made at this year’s state fair with an estimated 903,824 guests breaking the attendance record! The “Ag is Cool” program hosted an exciting and educational agricultural education program for guests of all ages. 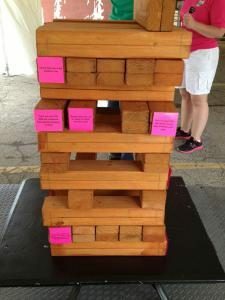 Put together by the Ohio Department of Agricultre, the Ohio Farm Bureau, and Ohio’s Commodity groups, the program had stations set up across the entire fairgrounds, which helped to enlighten the public about agriculture and to redirect the focus of the fair back to it’s roots. From inspecting and climbing up the ladder of a John Deere combine, to visiting with real life farm animals, playing giant Jenga, and learning how to spin sheep’s wool, the program was a hit! 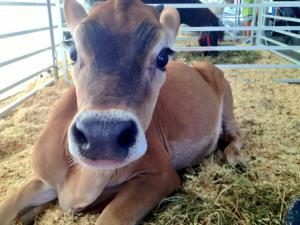 Fair attendees had the opportunity to take part in activities such as milking a real life cow, and watch livestock such as hogs and dairy cattle give birth! 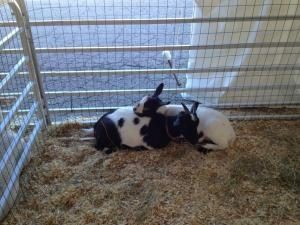 The “Ag is Cool” program is a great addition to the the educational programs at the Ohio State Fair because it helps to excite and educate children about agriculture. If a child is not from a rural area or around a community that hosts 4-H or agricultural education programs, they may not get the opportunity to learn about the industry. The program is open for people of all ages to particapte and recieve a scavenger hunt passport. 4th graders who participlate in the program and write an essay summarizing what they learned while at the fair are entered into a contest to win a scholarship! 4th grade teachers are also encouraged to participate in the program and submit completed passports in order to enter themselves to win an agricultural education based field-trip for their classroom!.